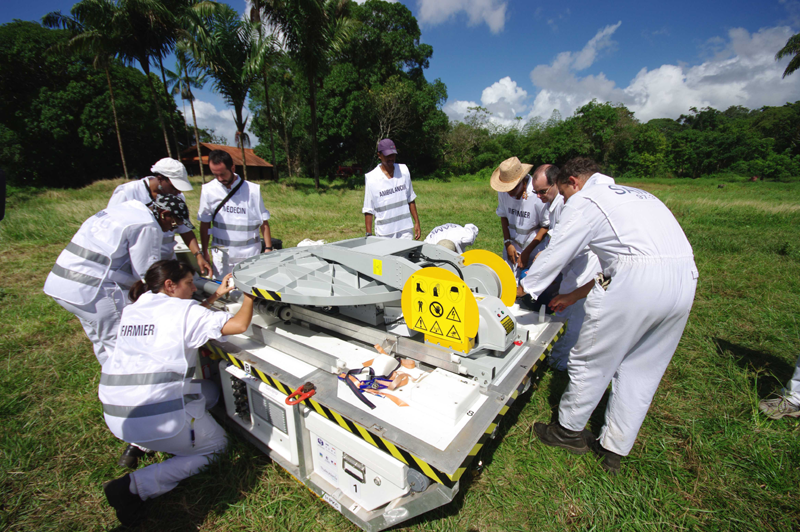 26 March, Operation Araponga demonstrated the effectiveness of the PSMA emergency medical aid unit during a final test run near the Brazilian border. Emergency services in Cayenne are now looking to obtain a satellite link to support operations in the long term. 26 March 2009, 5.00 a.m.: a commercial airliner with 70 passengers on board crashes in the vicinity of Saint-Georges de l’Oyapock, French Guiana, near the Brazilian border. A military patrol aircraft is scrambled to search for the aircraft. There are dead and injured. 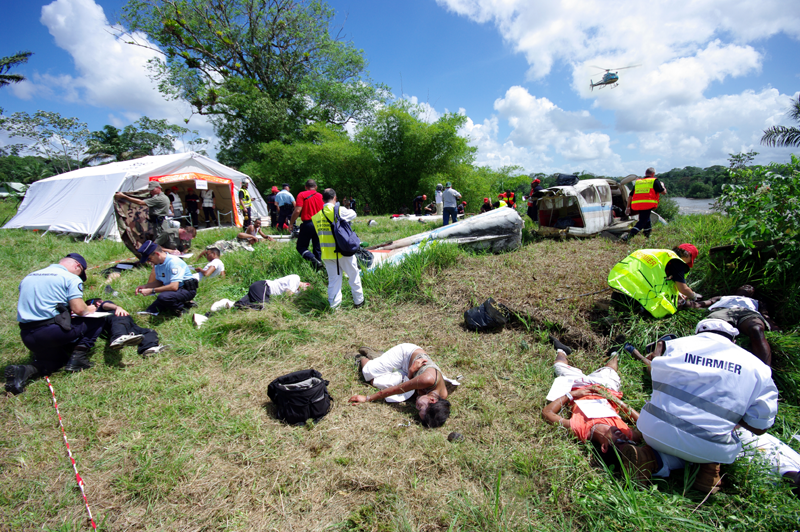 With no time to lose, an emergency response plan is activated at 7.30 a.m.
A highly realistic reconstruction of a crash scene at Saint-Georges de l’Oyapock, French Guiana. Credits: CNES/P. Collot. At 9.00 a.m., a forward medical unit is deployed near the stricken aircraft, but given the seriousness of the situation and after concerting with the emergency services, the Préfet of French Guiana, Daniel Ferey, decides to deploy the PSMA emergency medical aid unit. “It’s a revolutionary prototype able to establish medical communications links in the most remote regions,” he explains. Luckily, in this case it’s only a test run. Once airlifted to the disaster site, the PSMA unit is up and running in 40 minutes. Credits: CNES/P. Collot. This exercise was intended to test out emergency response plans on the ground and to ascertain the PSMA unit’s reliability. The unit made available to Cayenne’s emergency services by CNES is a heliportable container providing a satellite dish antenna, mobile communications equipment (telephones, computers, web cameras, Internet connection, etc.) and technical and software solutions designed for disaster management and triage of victims. Once airlifted to the disaster site, it takes just 40 minutes to deploy and establish a link with the command post to organize response efforts more effectively. 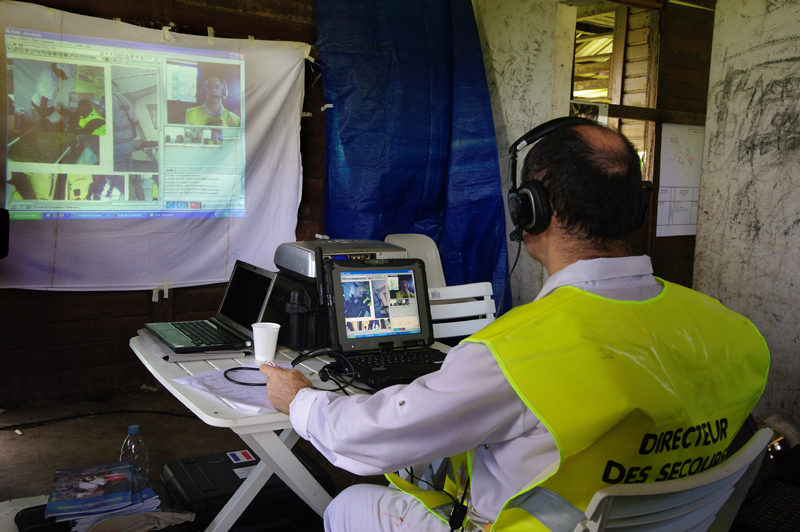 A videoconference link helps to organize emergency response more effectively. Credits: CNES/P. Collot. The 26 March exercise, like the previous one in May 2008, went exactly to plan. “The PSMA unit is the result of CNES’s policy of nurturing space applications to serve the population in French Guiana,” says Joël Barre, Director of the Guiana Space Centre. “We have been developing a telemedicine network here through the Guiana Mission for close on 10 years.” The PSMA unit has proved its worth during trials, now it is ready to be deployed for real. To this end, Cayenne hospital will need to obtain a broadband link to support operations in the long term.